What do you do with your mismatched Tupperware lids? I took several from a yard sale FREE box, in hopes of finding mates for other free Tupperware. The rest I stored in a Ziploc for later. 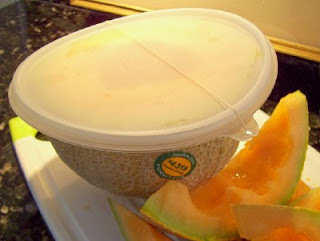 I needed a cover for this canteloupe, but Andrew had used all my plastic wrap for a diorama. To my surprise, the flexible Tupperware lid made an excellent fit! Grin--I cover my half-melons with those shower-cap plastic things from the dollar store. Nifty use of what you had on hand! Mama Squirrel, I love those shower caps. Last I looked, Andrew had taken mine for a costume project. I don't think I've told you how much your upbeat comments brighten my day! Thank you for taking the time to comment here so often. Your husband is clearly an engineer! Now, if he can only figure out a way for my salad plates to fit into the fruit drawer, I'll be set!